51 December 2017/January 2018 • TODAYSVETERINARYBUSINESS.COM mean taking a look at all our inven- tory, including the retail area, and determining which products and supplies we are using and which ones are collecting dust and await- ing their demise into the expired box. (Yes, we all have one.) This task can be done with your practice management software. Run an EOY (end of year) inventory sales report, find out which products are mov- ing and which are not, and use this information in a few different ways. Create a Stop List This is a list of items you decide to stop carrying in 2018. A couple of different factors should enter into this decision. Ask yourself: • Is this product still relevant? Is it older technology or medi- cine, and should we carry the newer or upgraded formula? • On the rare occasions we want to prescribe the product, should we instead outsource it or make it a special order? • Is the product in a similar class or does it offer similar ben- efits as other products that are more popular with your doctors and clients? • Does the hospital need the product immediately in case of an emergency? Snake antivenin comes to mind. In my practices, we might see two or three snake bite cases a year. Antivenin that hangs out in the refrigerator is ex- pensive, but when we need it, we need it. I often fi nd that veterinary hos- pitals are good about bringing in new items but not so good about discontinuing items. Five years later, the clinics are placing excess inventory in offices, bathrooms and the broom closet. How Much Is Enough? While we have the usage re- ports, let's determine how often we turn over our pharmacy and retail items. This can be accomplished by taking the average count on hand. To do that, take the number of items of a specific SKU that you typically keep in stock at one time and divide it into the yearly total sold. For ex- ample, we may carry five 20-pound bags of therapeutic ABC food at once and over the course of a year we sell 120 bags. This would give us a turn rate of about two weeks. Turn rates can be tricky. We don't want our inventory so lean that we constantly run out of prod- ucts. At the same time, we don't want so much inventory that we can't find the ringing telephone on the pharmacy counter. A goal of 30 days tends to be a benchmark for our turns. With large items such as food bags, this may not be possible due to space and storage constraints. We also want to be strategic and consider a 45- to 60-day turn cycle for the top 10 to 15 percent of SKUs. This is a longer period than what we normally want to see, but the demand for fast-mov- ing SKUs can fluctuate to such a degree that we want to be prepared. This also gives us wiggle room when there is a supply delay or back order. Crunch the Numbers Placing our end-of-year usage sheets in front of us, now is the time to evaluate missed oppor- tunities. Delegate some reporting and charting to your inventory specialist or lead receptionist. Have them create a comparison chart for some of your top retail and pharmacy categories. How did 2017 compare with 2016? Did we grow? Did we decline? Or did we just main- tain? Each number tells a story, and many of these stories end with the predictable line, "And there lies your opportunity." Listen to the numbers and realize that with additional staff training, more client education and some goal setting, we can predict future success in 2018 product sales. Next, set up a doctor meet- ing within the next 30 to 45 days. Review your findings with the doctors, share your stop list and get their input. Explain why you are considering changes, and solicit items they would like to see brought in for 2018. 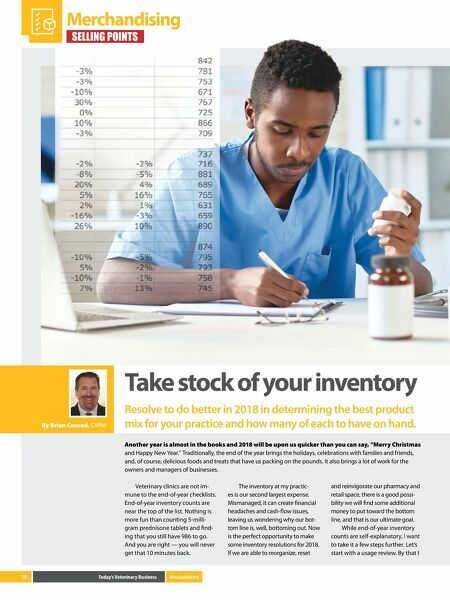 You may find with this conversation alone, you can add to the stop list and find supporting evidence that oppor- tunities exist within the practice to increase your pharmacy and retail sales. Additionally, share your research on turn rates and demon- strate that you are working to en - sure that the clinic will not run out of products or supplies during the year. Nothing is more frustrating for a doctor than being unable to do something for a patient because "we are out of stock." As opportunities are identified, purchase a large desk calendar — yes, paper is still sometimes need- ed — and set educational goals for each month. Have your inventory specialist reach out to the corre- sponding pharmaceutical reps and territory managers and leverage their support in refocusing the staff and regaining consistency throughout the hospital. It is amaz- ing what refresher courses can do for sales, and collectively, we are reminded that we are advocates for each client and pet. It is our job to educate clients on all the available offerings and advancements avail- able. In the end, we know that we have done our part in supporting a pet's long, healthy and happy life. Take the polar plunge with me this season and set reasonable and realistic 2018 inventory resolutions. Keep in mind what a vital and necessary — and expensive — tool our inventory is for a hospital. Create resolutions that will further enhance our offerings. Cheers to a prosperous, safe, meaningful and successful 2018. Selling Points columnist Brian Conrad is practice manager at Meadow Hills Veterinary Centers in Kennewick, Washington, and immediate past president of the Veterinary Hospital Managers Association. 1 2 3 Have your inventory specialist reach out to the corresponding pharmaceutical reps and territory managers and leverage their support in refocusing the staff and regaining consistency throughout the hospital.